The action of conserving something, in particular. Conservation for cultural institutions like museums, and archaeological and historic sites, refers to the first meaning of this popular word. In this case, cultural resources are the “something particular” being conserved, as opposed to rivers, wetlands, or other natural resources. Your grandmother’s quilt, family photographs, the Declaration of Independence, the space shuttle Discovery , Diego Rivera’s Detroit Industry mural cycle at the Detroit Institute of Arts, the Rosa Parks bus, the Great Wall of China, and the Giza Pyramids are all examples of cultural resources. Conservation is the profession responsible for the preservation of cultural resources like these, and the people who do this work are called conservators. 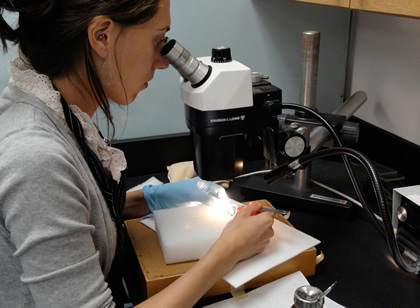 A conservator examines an object under a microscope. 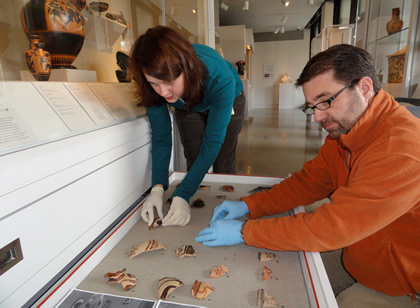 A conservator and an exhibit preparator install artifacts in an open storage drawer at the Kelsey Museum. Conservators must understand how artifacts and sites deteriorate in order to make recommendations about how to best preserve them. Sometimes conservation focuses on a single object, but conservators also work to preserve entire collections, sites, and structures. Conservation is an interdisciplinary profession that combines research in science and the humanities with practical application. Conservators work in a variety of settings including: museums, libraries, historic and archaeological sites, art galleries, and in private practice. A conservator and an archaeologist work to excavate and preserve a mosaic floor at Tel Kedesh in Israel. 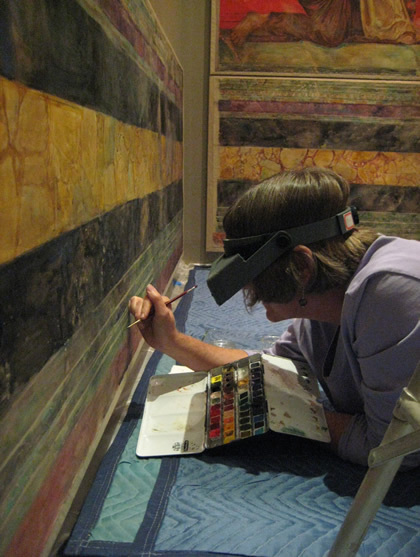 A conservator treats the Barosso watercolors at the Kelsey Museum. Who are the conservators in your neighborhood? Conservators usually work behind the scenes, but Southeast Michigan is home to many conservation professionals. Click here to read about a few.